This human flight hoax has been picked up by all the tech and gizmo blogs within the past 12 hours. They have Youtube videos going back several months, working machines, blueprints, blogs, press kits... pretty impressive. Nice catch. 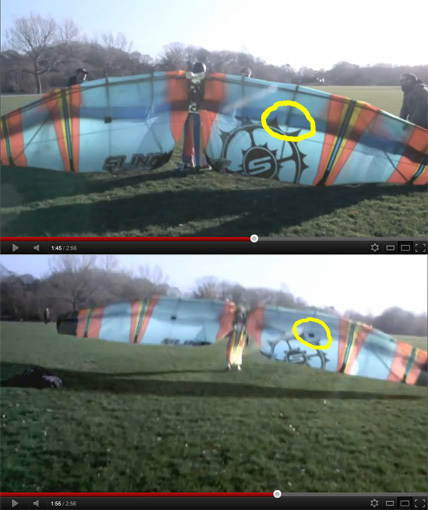 People are too focused on the latest video, so it will take time for everyone to realise its a hoax. I commented on the 13th video, describing your find, the comment requires approval however, and I doubt it will be. Could you explain what you mean by the "dead giveaway"? I'm not seeing anything in that section of the video. It's a puzzle. Watch the motor he made, and there are pics on the wings, proving its duck tape or something..
Nice catch. Also the shoes. They are black. Then they are white. Hi, I found your blog while looking into the "Human Birdwings" hoax, and I love it! I really enjoyed your post on audio watermarks too. Thanks for taking the time to do this! It was just tape and plus the wing fabric was folded over a little bit so it wasnt as noticable. If you ACTUALLY look, the tape is still there under the crease. Plus this dude has been making vlogs about this project from the ground up and showing off the technology theyve been using to make it. Im a pretty skeptical persom but this is the real deal my dude.